Purbanchal College Silapathar Recruitment 2018 September – Assistant Professor :- Purbanchal College has issued a recruitment notification recently for Assistant professor Positions. According to the Purbanchal College Recruitment 2018 September, a walk in interview will be held for filling up one vacant position of Assistant Professor in the Department of Education against study leave vacancy under UGC’s FDP Scheme. The interview is scheduled on 14th September 2018 from 11:00 AM onwards. The details of the recruitment can be found below. 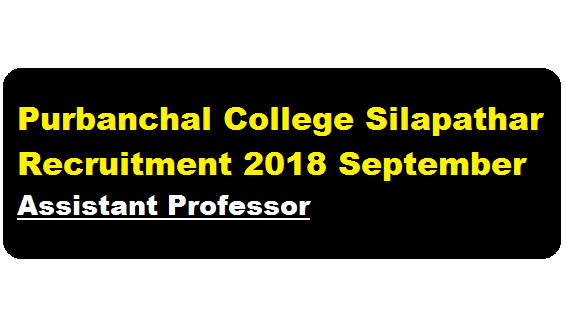 In this section, we will discuss in detail about Recruitment of Assistant professor post under Purbanchal College Silapathar Recruitment 2018 September with all the details and requirement. Eligible & interested candidates are invited to attend the walk-in interview to be held on 14/09/2018 from 11:00 AM onwards. ii) 5 nos of recent passport size photographs.